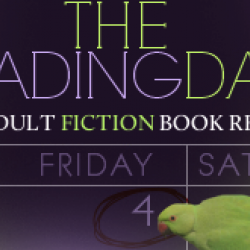 In Fracture, Megan Miranda’s debut novel, life, death, and an unusual paranormal talent are some of the themes explored. Seventeen-year-old Delaney Maxwell falls through an icy lake and is rescued by her best friend Decker Phillips. Delaney was without oxygen for 11 minutes and technically died, but through a medical miracle she beats the odds and comes out of a coma relatively unscathed. Delaney survives, though, with an itch that pulls her to people who are dying.The concept of Fracture is interesting overall and has potential, but the characters fell flat for me in this one. There are a lot of characters and ideas introduced in this book but the lack of clear focus caused me to lose interest at times. I wanted to read this book partly because the publisher compares it to some of my favorite books – Before I Fall and If I Stay. 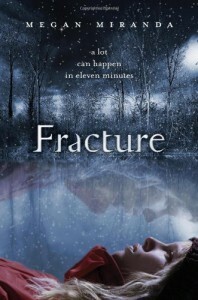 And though the life and death themes are somewhat similar, I found Fracture to have more of a paranormal feel than those books, and to have more in common with The Body Finder.Delaney comes out of her near-death experience with guilt for having cheated death, and confusion over how to handle her new ability. She is haunted and withdrawn after the accident, but things start looking up when she meets someone else who has the same ability to sense death. However, the way Troy looks at his power is completely at odds to how Delaney does, and she needs to decide what the ability means in the big picture and how she should use it.Neighbors Delaney and Decker have unsettled feelings that are further complicated by the guilt both of them feel after Delaney’s near drowning. He feels guilty for not acting quicker, and third parties and lack of communication keep them apart. Delaney’s parents also become over-protective after the experience, and struggle with handling Delaney and her unique problems.The book ramps up to a tense, suspenseful and surprising conclusion, but it lost some of its impact due to a rushed feeling and an unevenness and lack of focus earlier in the book. I did like the overall theme though, and questions it raises about what it means to live. The book has an interesting concept, fast pace and a lot of potential. I also liked the wintry feel of the book and felt that added to the story. Fans of The Body Finder or the Wake series may enjoy this standalone book. Look for its release in January 2012.